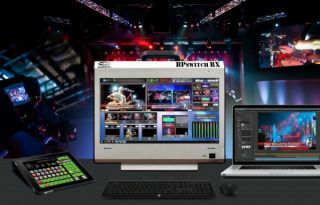 The What: Broadcast Pix will demonstrate a number of product upgrades and its new BPswitch RX portable integrated production switcher at IBC2018 (Hall 7, Stand C06), which runs September 14-18 at RAI Amsterdam. The What Else: BPswitch RX users can customize the BPview multiview on the 17-inch integrated touchscreen display, or use the optional Broadcast Pix Commander customizable touchscreen interface for simplified control. The system also offers secure, browser-based control, including full-motion video and access to all sources and workflow tools, through Broadcast Pix’s BPNet IP ecosystem, which is powered through the ioGates cloud-based media management platform. The Bottom Line: Well suited for sports, concerts, and corporate events, BPswitch RX is ready for the road. Built on a Windows 10 64-bit OS and housed in a durable aluminum alloy chassis, the self-contained system includes four multi-definition video inputs, plus two IP inputs that support RTSP and NDI protocol. Built-in production tools include an audio mixer, three keyers with DVEs, program recording and live streaming to Facebook Live and other CDNs, clip and graphic stores, and NewBlueNTX multi-layer 3D motion graphics CG.